When I was a kid, I read lots of novels set during the American Revolution. Every one I recall portrayed Patriots as “good” and everyone else as “bad.” As an American, I’m enormously proud of what our foremothers and forefathers did to establish our country. But the truth is, many good people fought on both sides, trying to defend what they believed in. And some wanted to stay out of the fighting all together, and simply keep their families and homes safe from the violence. I was already thinking about writing a Revolutionary War novel when I was invited to write a third mystery for Pleasant Company’s “History Mystery” series. 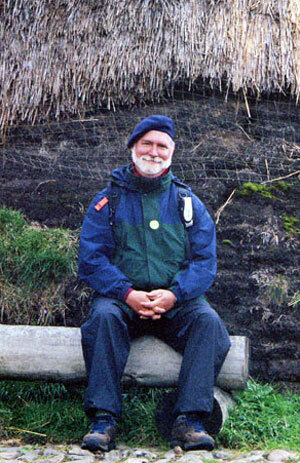 I chose to write about the Scottish community in North Carolina for a couple of reasons. I’d read a lot about these immigrants—many of whom had suffered terribly under English rule in Scotland. To the best of my knowledge, there was not a book for young readers out there that explored the experience of Scottish immigrants struggling to create new homes and lives in the colony. I have a wee bit of Scottish heritage myself. And the Scottish community in North Carolina was politically divided during the Revolution, providing lots of conflict to explore. Some Scots became Patriots. They had bad memories of British rule, and wanted to fight for American independence. Others decided to fight against the Patriots because they knew how harshly the British dealt with dissenters. How difficult it must have been, trying guess which side would prevail! I began with a simple premise. My main character, Elspeth, would be a newly-arrived Scottish immigrant in North Carolina. Her family, which had struggled to survive conflicts in Scotland, would face new challenges. All they wanted was a peaceful new home where they could start again—but with the American Revolution underway, everyone was forced to pick sides. Before I could begin writing, I had lots more research to do. So, off to North Carolina! The North Carolina Museum of History was a great place to begin exploring. 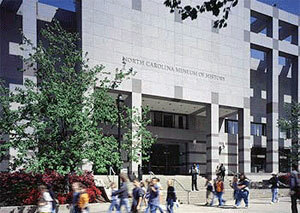 I also visited the North Carolina Museum of Natural Sciences. It’s no substitute for exploring outdoors! 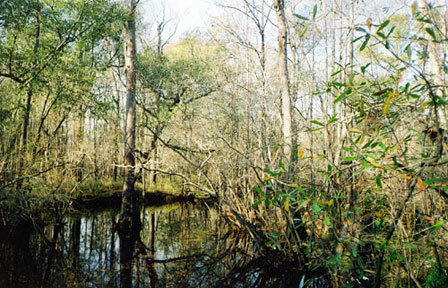 But I knew that the landscape Elspeth would have known, the Longleaf Pine Forest, was almost gone. The museum gave me at least a sense of the plants and animals that greeted the Scottish immigrants. Fortunately, there was still a place where I could see a remnant of the original Longleaf Pine Forest. 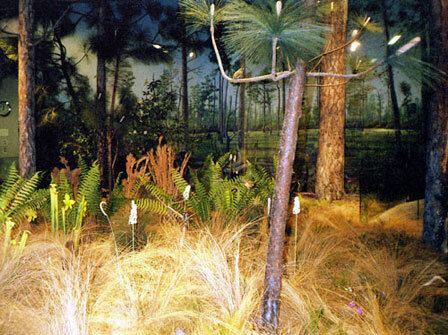 Fort Bragg, a huge military base, is still home to some swatches of this rare ecosystem. Some kind people got me hooked up with the base’s Cultural Resources department, who arranged for me to visit. The area was home to many early Scottish settlers, and I learned a lot from the people involved with archaeological work. I also got to visit Longstreet Presbyterian church, surrounded by longleaf pines. Walking here beneath the enormous pines, squinting at a couple of gravestones that had been inscribed in Gaelic…it was very, very special. 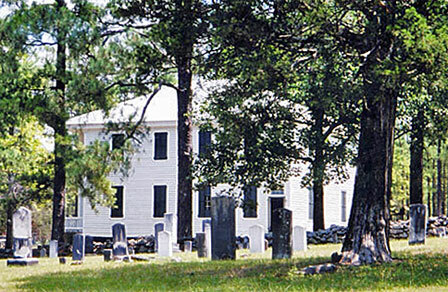 The church building itself doesn’t date back to the colonial period, but the cemetery does. There was lots more to see in North Carolina. I visited the Moores Creek National Battlefield on a quiet, sunny day when I seemed to be the only visitor. That was a special visit, also. Here, the Highland Scots who’d chosen to fight with the British made a courageous charge. “Shouting ‘King George and Broadswords!’ they advanced across a bridge, not knowing that nearly a thousand North Caroline patriots were hidden and waiting. I wandered the field, reading the interpretive plaques, and trying to imagine how the Loyalist Scottish men fighting there must have felt. I also visited the Scottish Tartans Museum. 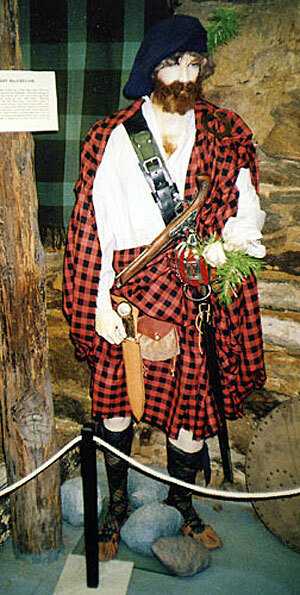 At the time of the American Revolution, particular tartans were not yet associated with individual clans, as they are today. 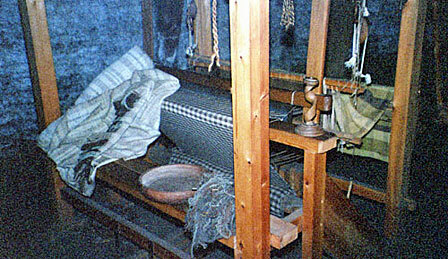 Still, it was helpful to learn more about the types of clothes worn by early Scots—and how they were made. That’s me, back in 1982. 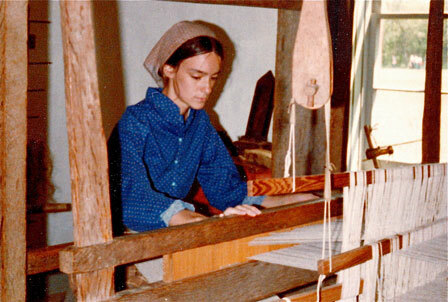 I loved to weave! So much time has passed since Elspeth’s time that little material culture remains. I’m grateful to a number of historians who were willing to help me imagine life during those turbulent times. And I’m grateful to my husband, Scott, who suggested that we travel to Scotland so I could learn more about Elsepth’s life before she came to the American colonies. I hope to one day write a prequel to Betrayal at Cross Creek, set on the Isle of Skye. That’s Scott at one of the open-air museums we visited in Scotland. 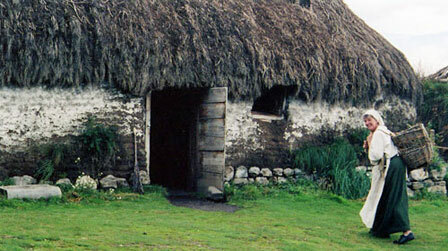 Elspeth’s original home might have looked something like this. 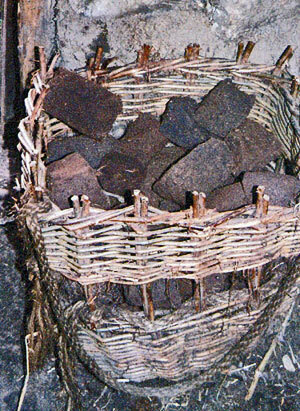 Blocks of peat waiting to be used as fuel. Betrayal at Cross Creek is, I must admit, one of my favorites among the books I’ve written. I hope you enjoy it too! The book is out of print, but a wonderful audio version is available. PS: After publication the book garnered a lot of attention, for which I’m deeply grateful. 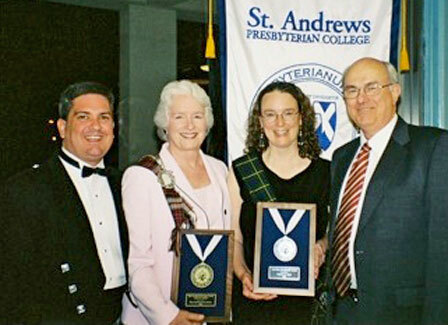 One of the greatest honors I’ve ever had came when St. Andrews Presbyterian College presented me the Flora MacDonald Award. I had done some research at the Scottish History Center at the College, and it was an amazing experience to return for the awards banquet. I’m in black, wearing the tartan sash of Clan Johnston, which was my maternal grandfather’s name. To my right is the talented Flora MacDonald Gammon, who was honored for all she’s done to preserve and share traditional Scottish music.